She is a web celebrity, with many of her admirers becoming vegetarians – meet Esther, the 300kg pig who will win your heart. Her owners once thought she was a mini-pig, but finally they got it that there is hardly anything mini about her. Esther’s owners - Steve Jenkins and Derek Walter - told RT how they got her three years ago, and she was supposed to grow into a mini-pig, about 70lb (30kg). “We thought we were just getting a cute little pet pig,” Steve and Derek said. 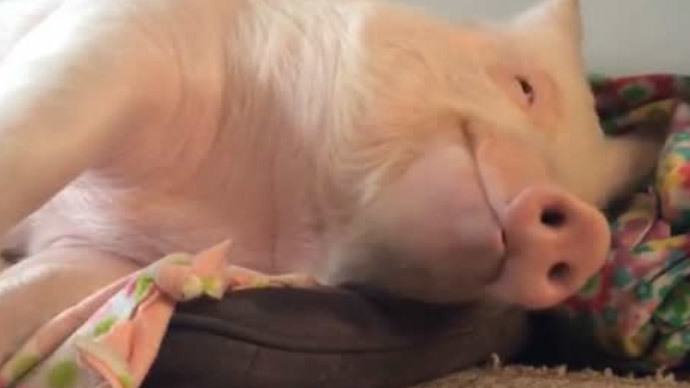 I'm just gonna take a little nap....until morning.Posted by Esther the Wonder Pig on 20 Апрель 2015 г. The owners added that they were “totally in denial” when she began to grow. ♫ Rain drops keep falling on my head....♫Posted by Esther the Wonder Pig on 20 Апрель 2015 г.
Esther has her own website and Facebook page where the owners share her photos and videos, getting excited responses. Everybody should wear a cape and a crown at least once a week.Posted by Esther the Wonder Pig on 19 Апрель 2015 г. Apart from being a major internet celebrity, Esther is “very interesting to watch,” as she perhaps doesn’t realize that she’s a pig. “She gets along with the dogs and the cats in the house,” Steve and Derek told RT. There's an angry mob forming and they look hungry, you better hurry up and get dinner ready.Posted by Esther the Wonder Pig on 20 Апрель 2015 г.